The Epsom Derby, Britain’s richest horse race and the second leg of the English Triple Crown, airs this Saturday, June 2, at 10 a.m. ET on NBCSN in the United States. 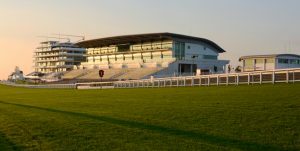 Presented live from the Epsom Downs Racecourse in Surrey, England, the horse race serves as the middle leg of the English Triple Crown, which began with the 2000 Guineas and is followed by the St Leger. The Epsom Derby is also the U.K.’s richest horse race, with a purse of more than 1.5 million British pounds (approx. $2 million USD). Saturday’s race features a field of 14 entries, including the undefeated favorite Saxon Warrior.